Guest Post by Gordy Hoffman, Founder and Judge, Blue Cat Screenplay Competition. People often ask me what makes a script stand out when its submitted to the BlueCat Screenplay Competition. BlueCat is one of the oldest script competitions in the world and I’ve been hand picking the winners since we began. I’ve personally reviewed thousands of submissions for the contest and many of our winners and finalists have gone on to professional careers. How does a script get selected to win against all the rest? What is it about the writing that separates the screenplay from the thousands of other submissions? First, screenwriting is hard work. This is definitely a consistent and universal characteristic of the winning scripts—–the evidence of hours and hours of sheer effort. You don’t often hear of how difficult the work is, the emotional, mental and spiritual cost behind effective storytelling. We discuss the “how” and “why” of screenwriting, but you don’t often hear of the time and challenge of the actual execution. You have to show up, and continue to show up, and not blink, in the face of great despair. The colossal bewilderment throughout the process of telling an original, emotionally compelling, and plausible story should be appreciated, accepted and always respected. Give us who you are. Tell us what you deeply care about, what you think is hilarious, what happened to you. This is your voice. When you hear people refer to “voice” or “personal voice”, do you know what this means? Screenwriting that has a strong personal voice is screenwriting where the writer is telling us where they are, right now, in their lives. What breaks their heart. What is still breaking their heart. What they find important. What they see in the world. Yet how does this sound practical? What exactly does this have to do with making a living as a writer or winning a contest? If you want to stand out from other scripts, accept the very fact you are indeed an individual that is unlike any other and your experiences with life have brought you to this point in time. What is immediate and raw and clear within you is the present moment and what you need and want and believe and love today. Connecting to a story that aligns completely with your present self gives you the best chance to write something that is passionate, clear, and emotionally engaging to your fellows in the audience. It’s not a theory or difficult to practice in your work. If you want your screenwriting to have a strong personal voice, become conscious of what means most to you in your life, and in your life TODAY, and commit to this as the heart and backbone of your script. And do not stray. Throughout the script, do not forget, with every choice, what is affecting you, and this will direct you to your strongest work. Next, be honest. Writers who fail to stay honest with what they know about the world and how it works will not maximize audience identification with the story. If you do not respect logic, the audience will not see the world they live in and will not have a strong emotional experience when they watch your work. If characters act in a way that’s not truthful, the audience will not see themselves in the story and will not connect. Honesty needs to extend to the world we live in and the behavior of people in this world. 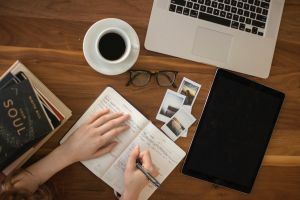 Writing in an honest and logical way would appear to be a very obvious principle to effective writing, but this is often what separates the success stories in our competition from scripts that don’t advance. If the reader does not believe your decisions involving character and plot, you lose your audience. The audience comes to the theatre to see their lives—-it’s the writer’s job to tell the truth. Another key quality of the tops scripts in a screenplay competition would be how original the work is. Challenge yourself to be fresh! Ask yourself—-have you seen this before? Writers are very keen when they sit in the audience, quick to point out something that is derivative. What is derivative? Derivative screenwriting is when the writer derives their choices from the written work of others, as opposed to their own life experiences or imagination! We see this quite often—-television and movies that remind us of something we’ve already seen. That’s derivative screenwriting. What successful screenwriting does is show us a perspective on the world that is new yet identifiable. Show us something we haven’t seen before and we will feel compelled to watch your story. This is very important. We come to watch and experience emotion and like a favorite song, like our lives, we seek new challenges and rewards. We are growing. Show us the new life and the new people and we can celebrate the changing world within your story. When writers write original work, they stand apart from everything we’ve already seen. Why do we want to see new stories instead of simply watching the ones we have again? Because we have changed ourselves and need something different. Using your voice to share with us who you are today imprints your work with own spirit. Remembering your history of personal experiences is also key to exceptional scripts. What has happened to you? What have you experienced? Writing what you know means telling us about your history. Writers are often shy or disinterested in writing about what’s happened to them. But all lives are unique, and if you want to stand apart from other scripts, pick the original specifics within the twists and turns of your life and incorporate them into a story. I encounter many writers that don’t feel like their own histories have much to offer, but ironically, the lives they have lived often are much more compelling than the scripts they are developing. Do not be scared to offload the funny, bizarre or embarrassing moments you’ve lived through, even the tragic. Be generous and fearless and you will find an audience quite fascinated and interested in what you have to say. Lastly, be humble when you write a screenplay. Don’t call attention to yourself as a writer. Don’t be cute or loud about your style in a script. Embrace what you think is important and don’t hide from the truth. Screenwriting is not about the ego or the writer or you. It’s a collaborative document that hundreds of others will use to create an emotional and spiritual experience for an audience. You will often be overlooked and no one will be impressed with your “writing” as much as they will be moved by your story. By accepting how difficult this is, letting yourself lose quite a bit along the way, you will make this work about your audience and not you. Writing television and movies is not about the writer. It’s about others. Writers who commit to giving back to the planet in the way of story often write beautiful things that turn into successful movies. Give, don’t tell lies, share courageously and work like a ditch digger—-these are ways to win contests and more importantly, write a person’s favorite movie, which is worth more than all the gold there is.